(Photo: Young-kun Park)Presentations are delivered at the Gathering Prayer on the first day of the 10th World Council of Churches Assembly in Busan, South Korea on October 30, 2013. BUSAN, South Korea - The 10th Assembly of The World Council of Churches started its two week convention with the opening prayer on Wednesday, October 30 in Busan, South Korea with scores of nations attending. The WCC Assembly is the highest governing body of the World Council of Churches (WCC); member churches come together as one in prayer, worship, and celebration every seven years. The opening prayer consisted of prayer, worship, and acknowledgment of the suffering within Africa, Asia, Caribbean, Europe, Latin America, The Middle East, North America, and The Pacific. 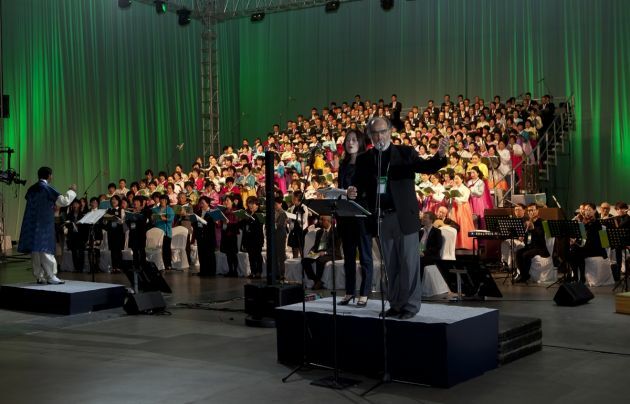 This year's opening prayer began with the church members standing together as one singing the opening song; Psalm 24 as thousands converged on Busan's BEXCO convention center in South Korea's second biggest city. "The earth is the Lord's and all that is in it, the world, and those who live in it; for he has founded it on the seas, and established it on the rivers." The beginning message of the convention at which 5,000 are expected to attend addressed the suffering specifically within the nations. "Cries and hopes" for each of the nations were addressed. 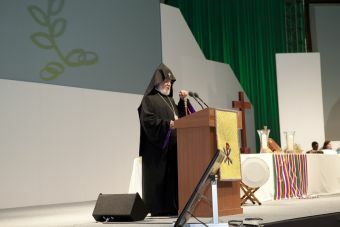 (Photo: Young-kun Park)Presentations are delivered at the Gathering Prayer on the first day of the 10th World Council of Churches Assembly on October 30 in Busan, South Korea. ; such as the girls and women who have been raped and now suffer because of the memory that haunts them, those who have lost a family member due to violence, and those who greed for power and money. "Cries and hopes from Asia, accompanying God, we see you in the tears and moans of girls and women raped, raped again and also gang raped, and of whose lives are broken beyond repair; in the wailing and mourning of mothers, wives and children who have lost their sons, husbands and fathers to mindless violence in the name of God." Asia also prayed about, "the greed of a few for power and money; in the sighs of the violated, displaced and silenced Dalit's, Indigenous Peoples, linguistic and ethnic minority communities; in the distress and disappointment in the eyes of millions of children who are forced to work, work hard and in hazardous industries; in the pain and anguish of those who are forced to eke out a living in faraway places and of the families that they leave behind." Church members were able to express acknowledgment and understanding of the suffering within the nations through prayer and worship. This allowed each person the opportunity to pray for their own nation and other nation's sufferings. Outside the main center a gaggle of protestors who has turned out in force the day before railed against what they see as the evil ways of the WCC. David Seok, 24, student at Youngnam Theological University and Seminary in South Korea, came to WCC for one day to get a better understanding of other religions, traditions and beliefs. "What I am trying to get out of this experience is the understanding of how others worship God and their core beliefs," Seok said in an interview. While many are for the Assembly, others are against it as was demonstrated by Korean protestors outside the assembly hall at Busan's BEXCO convention center who believe the WCC is abandoning Christianity in its quest for contact with other faiths. Seok explained he is stuck in the middle; he recognizes the positive aspects of the meeting, but because of his own personal beliefs, he does not support what others preach about or support that contradicts his beliefs. "I am for the assembly because every nation is able to come together and be united as one, even though our worlds are completely different. "After hearing the suffering in both my nation and others, it touched me because I realized we are all here for another, regardless of our background. "The reason I am against the assembly is because I do not have the same beliefs as others who are attending; it is challenging to understand others beliefs or what they support. "I do not support men marrying men, but many others at this convention do, and I do not believe in multiple God's; like most Korean's, I believe in only one God," Seok said. This Assembly that occurs only once every seven years allows the opportunity of understanding, challenges, acknowledgement, engagement, the hope for justice and peace, and a renewal in unity, worship, mission and service. "The World Council of Churches for its member churches is a unique space: one in which they can reflect, speak, act, worship and work together, challenge and support each other, share and debate with each other," the WCC website oikoumene.org states.